Many people have no idea whatsoever exactly why they end up dealing with diabetes. When you have it, it is natural to worry that your child might also get affected and develop the same. This makes people ask, "Is diabetes hereditary?" Is it possible that your children will inherit diabetes from you? The truth is that diabetes is not inherited in a simple pattern, but certain factors certainly increase the risk of diabetes. For instance, you may be at an increased risk of diabetes genetically but you develop it when something in your environment triggers that predisposition to diabetes. It implies that genes alone do not indicate that you will eventually have diabetes. Let's find out more about it. Type-1 diabetes is not that common and is usually diagnosed early in children. Experts believe that genes have a greater role to play in Type-1 diabetes. Still, you may not develop diabetes just because of certain genes because many environmental factors are also important. Where you live or what foods you eat while growing up will still have an impact. As far as the type-1 diabetes is concerned, there is no specific gene involved in it. A bunch of them may play a role though, including the HLA genes. These genes make proteins, keeping your immune system healthy. The HLA genes may be involved here because type-1 diabetes is mainly an autoimmune disease. Therefore, some experts believe that the types of HLA genes you get from parents may increase your risk of developing type-1 diabetes. The important thing to bear in mind is that even though some genes make you more susceptible to developing type-1 diabetes, it does not mean you will always have the disease. That is the reason why that sometimes one of the identical twins who have the same genes may have diabetes and the other may be completely healthy. Studies show that if your father has type-1 diabetes, there is a 1 in 17 chance that you will have it too. If your mother has it, there is a 1 in 25 chance that you will have diabetes before age 25. If you do not get it by the age of 25, there is only a 1 in 100 chance that you will eventually have type-1 diabetes. 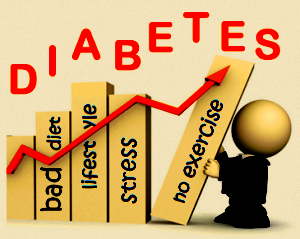 It is worth mentioning that some factors can increase your risk of developing type-1 diabetes. For instance, you are more likely to have it if both of your parents have the disease. In this case, your risk may be as high as 1 in 4. Is diabetes hereditary? Yes, it can be the case with Type-2 diabetes. Still, it does not qualify to the fact that you will certainly have it if your parents have it. It certainly increases your risk though. In many cases, people who are diagnosed with type-2 diabetes usually have someone else with the same disease in their family. If your parents develop this condition before the age of 50, there is a 1 in 7 chance that you will have it too. The risk comes down to 1 in 13 when your parents develop the condition after the age of 50. There is a 1 in 2 chance that you will have diabetes if both of your parents have type-2 diabetes. Both genetic and environmental factors play a role here. Several gene mutations are held responsible for leading to type-2 diabetes in people. Keep in mind that even if you carry a mutation, it does not guarantee that you will have diabetes. Obesity increases your risk of developing type-2 diabetes, and genetics play a role in determining your weight. Therefore, genes do have a role to play a here. Interestingly, different gene mutations may increase your risk. Even though the contribution of each gene may not be huge, this can lead to different mutations that in turn may increase your risk. Experts believe that mutations in genes that are responsible for regulating glucose levels can increase your risk of type-2 diabetes. It also includes genes that control the production of insulin, production of glucose, and how your body reacts to glucose levels. Some of the most common genes that may increase your risk are TCF7L2, CAPN10, ABCC8, GCGR, and GLUT2. Consider undergoing genetic testing to get to know more about your risk. Knowledge about your risk for diabetes will help you make better lifestyle choices. If you are a mother with Type-1 diabetes, it is important that you breastfeed your child at least until 6 months. You should introduce solids only after 6 months. If any of your parents have diabetes, you should be very careful about how much weight you gain. Even when no one in your family has diabetes, it is still a good idea to maintain a healthy body weight to avoid developing this condition. Maintain an active lifestyle whether you have a high risk for diabetes or not. You can lower your risk significantly simply by exercising for half an hour at least 5 days a week. Maintain a healthy diet. When you are at an increased risk for diabetes, eating several smaller meals at regular intervals will help promote satiety and prevent overeating. Increase fiber-rich food in your diet to lower blood glucose levels. Eat vegetables, fruits, and whole grains. Monitor your blood glucose levels regularly if you are at an increased risk for diabetes. Do not ignore any common symptoms of diabetes, such as exhaustion, excessive urination, unexplained infections, and frequent thirst. Does Diabetes Make You Tired?